A small group played for the school's Summer Fete which was enjoyed by all who attended and then the full band performed later in the day at Welford's Fete. This time after a short thunderstorm and downpour the sun came out and we had a glorious evening. The event was very well attended and our thanks go to Mike Coates for inviting us to take part with the Wycliffe Drama Group in this fundraising event for both groups, at his home at Ash Tree Farm. Unfortunately the weather was so bad that the band was unable to play and the engagement was called off at the last minute. Lutterworth Town Band was once again pleased to provide musical entertainment for the Willey Street Fair. The day was fortunately blessed with quite a lot of sunshine and.the fair was well attended. Everybody appeared to enjoy and appreciate the varied programme put together by our Musical Director, Mike Wildman. Lutterworth Town Band was pleased to be asked to play a selection of music while the results of the contest were being prepared and the varied programme was well received by all. Lutterworth Town Band will be playing as part of the Ratby Musik Fest on the 9th May at Groby College. The band will be playing from about 8.15. We have also added another engagement to summer programme on August 24th where we will be playing at the Barwell Brass On The Grass. This week's British Bandsman includes a tribute to our former President Gerald Fry who sadly died at the beginning of this year. His contribution and support for the band for over 15 years was appreciated by all of the members and he will be sadly missed. We start this year with a special concert on Saturday 1st March at St. Mary's Church Lutterworth with a joint "Best of British" concert with the Wycliffe Drama Group. Included in the concert will be a celebration of English writers, some of the nation’s favourite poems, extracts from some of the nation’s favourite plays, music as diverse as Noel Coward, Lionel Bart and Lloyd Webber and the evening will culminate with Lutterworth Town Band leading the audience in a ‘Last Night of the Proms’. Before Christmas the band decided not to send Christmas Cards to other band members - we do see a lot of each other after all! Instead a collection for charity was made and a total of over £100 pounds was raised for the DEC Philippines Disaster Appeal. Well done to everyone. Pleased to confirm that this year's charity concert with the Lutterworth & District Choral Society will be on Sunday 15th December at 3.30. This years chosen charity is Q4IS - Quilts for Injured Servicemen. You can find out more about them at www.w4is.co.uk. Today's Bruntingthorpe fete egagement is on, so see you there! Thanks to everyone who supported us for the January "Waitrose Community Matters" . We are pleased to confirm we have received a donation of £381 from Waitrose which will go towards the purchase of new music and instruments.Thanks again to everyone who donated their little green coin to us! There is a new way of showing your support for the band! Throughout January at the Lutterworth Branch of Waitrose you can support the band through its' "Waitrose Community Matters" scheme. Every month the store will donate £1,000 between three local good causes that you choose. This month the band has been chosen as one of these good causes. At the checkout you'll receive a token, which you then place in the box of the good cause you'd most like to support. The more tokens a cause gets, the bigger the donation they receive.So please support us at the checkout and also remember to tell your friends! 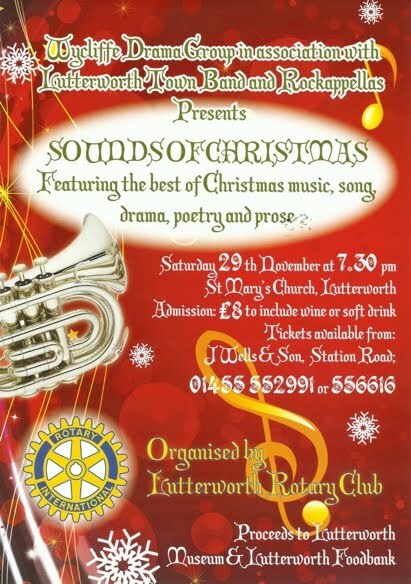 The Lutterworth Town Band together with the Lutterworth Choral Society performed their annual carol concert at the Methodist Church yesterday. A packed house heard some great singing, playing and wonderful readings to get us into the Christmas spirit. More importantly over £500 was raised for The Hope Foundation for Cancer Research and the latest band photo was taken (above left). As the band gathered to play Carols on Sunday 9th December they were saddened to learn of the passing overnight of their previous conductor John Mattock. John was part of the group who were responsible for the reforming of the band and in addition to being the bands conductor for many years also played cornet. When ill health meant John could no longer play with the band he would regularly be seen at engagements and the family connection remains with his grandson being the band's percussionist. John remained as a vice president of the band and was due to join with the band to help collect as they play their annual carols for the shoppers at Lutterworth Co-op on Christmas Eve. John and his family will continue to be remembered by all in the band at this difficult time.